Honey & Dandelion Soap is probably the most popular soap I’ve ever made. It sells out as quickly as I can make it and happens to be a personal favorite, as well. It’s loaded with fresh dandelions from our fields, raw honey from our bee hives and organic tamanu oil – making it especially useful for those with persistent skin conditions such as eczema & psoriasis. My original version used two types of palm oil, one white and one red. I revamped the recipe to remove palm products, but wanted to keep a similar color to help ease existing customers to the new version, so added a bit of annatto seed. You can certainly leave that out and have a lighter, creamier colored bar. You could also use yellow Brazilian clay or lemon peel powder for a more yellow tone. 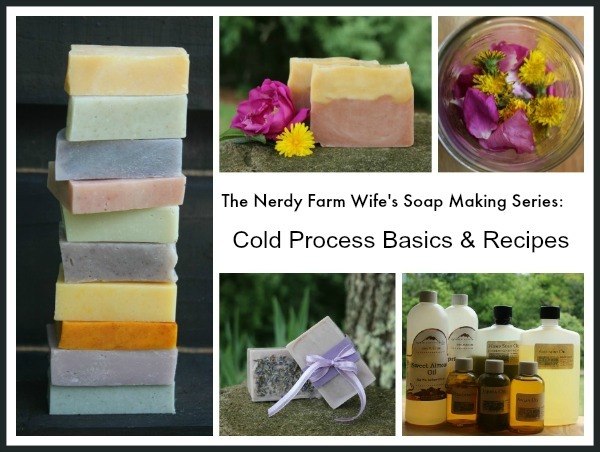 This is a Cold Process Soap recipe. For a version of this soap that you can make in your crock pot, click HERE. An overview of basic directions can be found in my Soapmaking 101 post. Check your local supermarket or health food store for some of the oils. You can buy most of these ingredients at Mountain Rose Herbs or Bramble Berry. Gather fresh dandelion flowers and leaves, rinse well and then place in a heat proof pint jar. Fill the jar about half way full with dandelions then pour steaming hot water over top. Let this infuse anywhere from an hour to overnight. 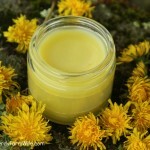 Strain and reserve 10 ounces of the resulting dandelion tea for your soap recipe. Note: Honey can accelerate trace (speed up the mixing process) and it also makes your soap heat up more than without. If your house is warm, you may only need to cover with a sheet of wax paper. If your house is on the cool side, you may want to cover with a towel or blanket. Peek at the soap every so often and if you spot a crack forming, it means it’s getting too hot and you should move it to a cooler place. For optional color: Use 3 tsp annatto seed powder for an orange color, as shown, or 1/2 tsp annatto seed powder for yellow. My homemade wooden one – roughly 3 pound mold with inner dimensions: 8″ x 3.5″ x 3.5″. It yields 7 or 8 bars. 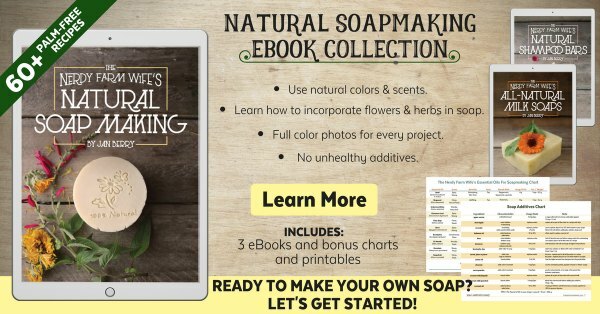 Here’s a great site that will tell you how to calculate how big a batch of soap you should make for the size mold you have. Remember you can easily adjust amounts using a lye calculator. Tagged dandelions, soap, soap making. Bookmark the permalink. why do you have to use lye? I like organic soaps, but when you add the lye is not organic anymore. Why can’t you make them whithout it? Hi Mafalda, You have to have a caustic substance in order to create the chemical reaction that turns oils into soaps. In past times, they used wood ashes, which would be a more natural source for sure. The problem though is that it’s hard to get a standardized pH with those, so that’s why old fashioned ‘lye soap’ got a reputation for being harsh sometimes. Once the lye (sodium hydroxide for bars & potassium hydroxide for liquid soap) has done its work on the oils and turned them into soap – then the lye is no longer ‘in’ your soap. Any soap that you buy on the market has to have lye (sodium hydroxide) in it, even if they disguise it in the ingredients. It may say sodium tallowate or sodium palmitate or sodium cocoate – but all that means is the sodium part of the lye has reacted with: tallow, palm oil, or coconut oil respectively and made soap. Sometimes you might see “saponified olive oil” or “saponified coconut oil” on a label – that also means it’s oil reacted with lye. If you find a lye free ‘soap’, it’s not really a soap, it’s a detergent and likely filled with several chemicals that *are* still there and much much worse for you and your skin. Wow. You are a queen at explaining, although I’ll check out Dr. Bonner’s since you think it’s better. I’ve been making soap for a couple of years now and have read way too much on the subject, but have never seen such a concise explanation of the lye action. Your blog is a wealth of info!
. So glad to have found you Jan. I just ordered the Ginger Issue of your magazine. Can’t wait to receive it in the mail.. :) Thank you for having such great talent..
Great reply and explanation. I hope Mafalda got to read it and understand the chemical process a bit better. No lye, no soap. It’s as simple as that. You can NOT have soap without lye. 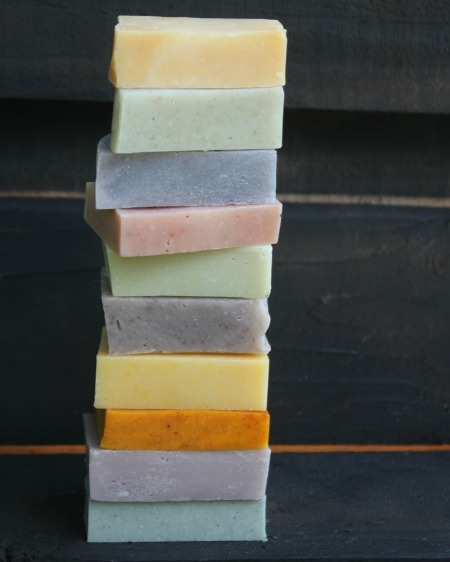 If someone tells you that they “make” soap without lye, they are probably buying a melt and pour base (which was made with lye) and just melting it, adding color, scent and different additives to it and calling it “handmade”. And liquid soaps use Potassium Hydroxide in order for it to stay liquid. Adding Sodium Hydroxide to oils to cause them to saponify and make soap is perfectly “natural”. Mafalda, there’s no such soap without Lye. Even though that Melt and Pour Bases are made from oil and lye, but different process from the cold process soap making. If you want, you can try the old days procedure which is wood ash, and mix with distilled water then pour it to the desired oil(s). Thank you so much for the recipe. 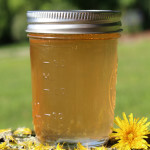 I have one question I would like to ask, I to make some dandelion tea, but I also infused the dandelion in my sunflower oil. I was wondering, could I use that oil also since you are asking for sunflower oil? Hi Jan! So, I just found this recipe and I have a question or two, 1) Can I substitute safflower oil for the sunflower oil? and 2) did you have any problems unmolding this? Maybe because of the high olive oil content mine is still pretty soft, and upon unmolding it, some was still left in the mold. Should I throw it in the freezer? Or even let it sit for a week to further emulsify? Hi Tanissa! You could certainly try safflower oil instead of sunflower oil. High olive oil soap does tend to be soft at first as does soap with honey. Are you using a silicone loaf mold? Those will naturally take longer since it forms a type of seal where the moisture can’t evaporate as well. For this batch, you could leave it sitting in the mold an extra few days, or as you say – pop it in the freezer until firm and then try to unmold. It should be fully saponified at this point, it’s just getting air all around it so the extra moisture can evaporate and speed hardening. One thing you could try in future recipes for speedier unmolding is to drop the amount of water/liquid down, so it’s just twice as much as the lye. So, if the recipe calls for 4 ounces of lye, use 8 ounces of liquid in the recipe. Another idea that helps harden soaps a bit is stirring 1 tsp of table salt into the hot lye solution. Some people like sodium lactate, but I find salt easier, cheaper and just as good. If your lye has lumps or clumps in it, that could indicate moisture reacted with some of it and your lye won’t measure out correctly, leading to a softer batch of soap. Also, if your scale’s batteries are getting low, that can affect measurements too. One final idea – is to make sure that you’ve truly reached trace before pouring into molds. Sometimes, the soap goes through a false trace, just from the whipping action of the stick blender. If you let your soap sit for about 30 seconds or so after you think you have trace, observe and see what happens. If it thins back out and/or gets a thin layer of oil on top, it didn’t truly trace and needs more stirring or you risk a soft or undermixed soap. If it still holds the trace though, then you’re good to go! Thank you SO much! I actually realized that I hadn’t reached a full trace yet, it was just as you said! It was sooooooo soft and crumbly, however, when it finally began to unmold, it looked terrible. I redid it last night and it came out lovely (because I didn’t have any dandelions, I used chamomile, and it came out perfectly)! Thank you so much for the salt idea! If I were using like a 4 lb. mold, would I use 1 tsp (of salt) per lb? Or just 1 tsp for the whole batch? I will be trying that in the future! Thank you again, I appreciate you!! I made this soap yesterday using water instead of dandelion tea. Trace was slow to appear and thin. This morning, my soap is still creamy like pudding. Should I just leave it in the mold for a few days? Hi Betty! I’m sorry to hear it did that. I would definitely leave it in the mold a few extra days. A few possible reasons for soap coming out this soft: not enough lye (did you measure by weight? ), too much water (especially since this recipe leans towards having more ‘soft’ oils), or too much heat lost when stirring/within first few hours. Usually this soap reaches a thick trace really fast for me (in part, I think because of the honey.) Did you use a stick blender or stir by hand? I hope those few extra days in the mold will help – keep me posted on how it turns out! I measured by weight. I think “lost heat” is the answer. I read on another blog to stir over an ice bath. My little test bar that I always pour into a used apple sauce cup was also soft. I put that baby in the freezer and it popped right out! No hurry to unmold the 5# batch, I’ll just let it rest a while. I love your blog and look forward to trying some more recipes. I am still new at soap making, this being my 4th recipe. I am allergic to Shea Butter is there something else I can use? Sure! You can use mango butter or cocoa butter or even more olive oil or something like castor oil… whatever you change out, just be sure to run the new list of ingredients and amounts through a lye calculator like this one: https://www.thesage.com/calcs/lyecalc2.php Using a different oil almost always means using a different amount of lye in your recipe. lovely recipe, im going to give it a go tomorrow – a question about the measurements – is that US or UK oz? Hi Sally! I use US measurements and they are all by weight. Hi Jan. Thanks for this recipe. I’ll make it soon when I have enough dandelion in my yard. They are growing :) I made your rose recipe it came out really good. Do you make cream soap? Can you use part dandilion infused olive oil instead of part calendula? OH, Jan, I made this soap yesterday and it’s setting up. I can’t wait to take a peek at it! I infused turmeric in the stir in amount of shea butter. The color is amazing! Shall I let you know how it turns out? Thank you so very much for the idea and the recipe. God bless. I apologize for not getting back sooner to you on this lovely soap. I found the soap took a bit longer (than other soaps I’ve made) to harden, but that’s probably due to the excessive humidity we experienced. The soap is pleasant. Next time, though, I’ll try annatto for coloring as the soap, while quite pretty, is more on the orange side and I was hoping for yellow. Jan, thank you for so freely sharing this and your other amazing recipes/formulae. God bless! that yellow that is the 7th bar down in the tall stack of soap is colored with 1/2 teaspoon annatto seed powder in a batch containing about 30 ounces of oil. Right below it is orange made with 3 teaspoons annatto seed powder. You can add it at trace and you won’t get a speckled look. I love the yellow tone and will probably go for that shade next time I make dandelion soap again! Thanks, Jan. It’s good to know about not getting speckles. The speckles are fine, but sometimes the solid look is more preferred. Have a great evening! God bless. Any chance of getting your recipe with the red palm oil? I have a bunch of it, and can never find any recipes for it. Thank you! at trace add: 1 oz melted beeswax (optional), 1 1/2 oz raw honey, 1 tablespoon jojoba oil, 1/4 tsp rosemary antioxidant (optional), 1 tablespoon shea butter, 1/2 tablespoon tamanu oil. You could substitute more tamanu oil instead of the jojoba oil and shea butter, if you’d like. Thank you! I did receive your email with the recipe. My husband and I just picked a bunch of dandelions to make the tea. I already made some infused oils, including olive oil and sunflower, so I am all set to make this tomorrow. I am very excited. Thank you so much! I’m so happy that you like the recipe! It’s one of my favorites too! Thanks so much for this blog post! I also keep bees and so we have a sort of mix-mash of honey and wax (from the decapping). I’ve already separated out as much wax as I could (which involved “cooking” the honey). Since the honey is no longer raw and is also mixed in with quite a bit of wax, I was hoping to use it to make soap. But because I don’t want to separate the wax and honey, I’m not sure about the proportions. It sounds like you used the same stuff more or less? So are you just sort of adding 3/4 of an ounce of a mix of honey and wax? Or do you separate it out and measure each? Thanks so much! Yes, it sounds like we are using the same stuff! Only mine is the one step before you cooked it. It’s very honey heavy. I have no idea exactly what to call it since it’s not easily available on the market, so mix-mash is a perfect term! :) What I originally did in the batches made before I published this recipe online was to just dump a glop of it in at trace, without trying to separate (or measure) it. But, since “glop” isn’t good terminology for a blog post recipe and people like to know precise amounts, I tried to approximate how much honey/beeswax was in it so people could duplicate it. I would say about an ounce of the mix-mash would work for your soap recipe. Since it’s already soft, it should blend in well without having to be melted, or you might want to soften it some if needed. I hope that helps! Good luck making soap with it; it’s a wonderful additive – one of my favorites! If I wanted to add an essential oil or blend several EOs to the Raw Honey and Dandelion Soap what would you suggest? Hi Kim! This is one that I really like plain, but if I needed to add a scent I might would try lavender or lemongrass first. If you add up the ounces of oil, water, and lye in this recipe, you get 44 ounces. There are 48 ounces in three pounds, which is really close to 44 and why we call this a recipe for a 3 pound mold. A five pound mold can hold around 80 ounces. (5 lbs x 16 ounces/lb = 80 ounces) Your recipe can be 77 ounces or something a little different, you don’t have to aim just for 80, just somewhere close. On the lye calculator main page, they have different oils listed with a little box beside each one. Fill in the number of oils in this recipe. So beside olive oil, write in 14, beside coconut oil, put in 8 ounces, and so forth. The superfat % for this recipe (and pretty much all of my other ones) is 6%. There’s a place for that too. Then you hit the little button at the bottom to calculate the recipe. The next screen shows you the results with percentages of oils and recommended amount of lye and water. Then a place under that where you can resize the batch from 30 ounces total oil to a new number. If you put in 50 then hit the resize button, you see that the total of oils, liquid and lye is a little over 73 ounces, especially when you count in your honey, you’ll be about 74 ounces. You’re aiming for 80 ounces or close. If that’s close enough for you, you can go with that, or if you want to get a bit closer, you can try 52 or 53 ounces of oil and then resize again. LOVE YOUR SITE I THINK IM ADDICTED CANT WAIT TO TRY THIS SOAP IT WILL BE MY FIRST TIME MAKING CP SOAP. I have to try this recipe. I love making soap, but haven’t for 5 years.. I moved and lost my customers. This recipe sounds great. Where’s the directions on the dandelion tea? I need to pick some before there gone for the year, and I’m in Minnesota, it’s already cooling off up here. If you don’t have enough dandelions to make that much tea, you can still make a partial amount and then use plain water for the rest of it. 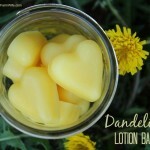 Love dandelion tea and soap making was wandering if you have a melt and pour recipe for dandelion soap?? Hi Ivy! I sure don’t have one. I don’t do a lot with melt and pour, but if I find a way to make one I’ll be sure to let you know! Wonderful recipe and very pretty blog! I love all your recipes, your life sounds amazing! Can I make this recipe using half dandelion tea, half goats milk? I am new to soap making and was trying to find a way to incorporate goat’s milk. Thanks! I just love reading your blog and getting ideas! Just wondered if you have any experience with hot process? Would the honey/beeswax part be any different? I have my oil, just have to wait to get fresh flower for my tea as soon as they start! What does this soap smell like with no essential oils? Hi Jenny, I’ve gotten several questions about that, so can’t wait until more flowers appear so I can test out a hot process version myself! It should work in a similar way, except I plan to leave out the beeswax and add the honey after cook time. (Since honey can scorch easily, I’d mix the honey with some water or a bit of oil first, instead of adding it straight in.) I’ll be sure to post the recipe up, once I make a successful batch too! Without EOs, this soap smells a bit like honey. Without the honey, you’d just have an unscented bar. I was out picking dandelions in my local churchyard yesterday to make the ‘tea'(I felt like a witch! 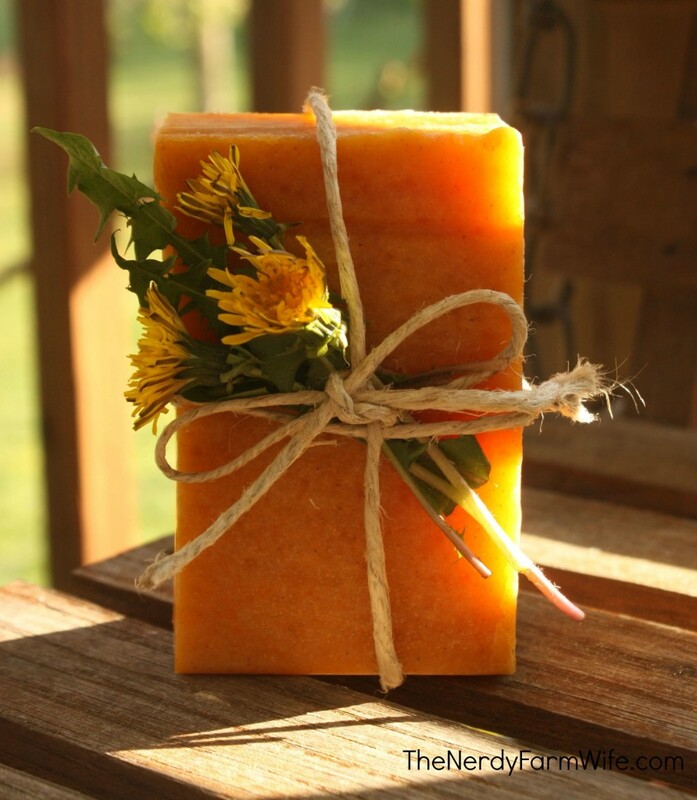 )and will make this soap today. Thanks so much for the inspiration. I will let you know how it turns out. I’m grating a pure beeswax candle to add some to the mix. Where can we purchase your soap products? Hi Gwenn! I don’t have any items for sale right now. I was thinking about offering some this summer, but we’ll see how busy it gets. I’ll keep everyone updated on here or via my newsletter! I was reading about Tamanu oil. It said not to use if you have a tree nut allergy. Hubby is allergic to tree nuts and he’s the one I was going to make this for. He has psoriasis. Any thoughts on a substitute oil?….I so want to make this but not hurt the guy! Hi Cindy, While tamanu oil is a key ingredient for healing skin, I can definitely understand your husband’s need to avoid it! Another oil that’s excellent for skin problems is rosehip seed oil. That would be my first choice to use instead. You could also try substituting hemp or avocado, which I think are classified as being from seeds & not tree nuts. (It’s been a long time since I needed to research food families for my son though, so I’m a little rusty on these things!) I know coconut is sometimes a problem too for those allergic to tree nuts, so you could substitute babassu oil directly for that, without needing to change the amount of lye. (Babassu can be found on amazon.com and from what I’ve read is from a fruit, similar to palm.) I hope that your husband likes the recipe! Is it normal for the dandelion tea to smell a little putrid? Thrilled to try this, thank you for sharing. Hi Penny! Sometimes herbal teas smell pretty weird and then when you mix the lye into them, they’ll smell even weirder. (Though sometimes, they smell a lot better than just lye/water.) The dandelion tea shouldn’t smell rotten, but as long as you didn’t leave it infusing for days at room temperature, it should be fine! Thank you! I will make some today. I have a quick question. I have my dandelions picked and wilting, will put them to soak tomorrow. Your recipe calls for tamanu oil . Is there a cold subsitute as I don’t have it on had and it’s quite expensive . I was planning on substituting tamanu oil for tee tree oil. I’m wondering if the smell of tea tree oil will over power the other ingredients. If I did lemongrass EO instead of tamanu oil will the measurements all be the same? Hi Julie! Tamanu oil is a regular oil like olive or sunflower, so needs to be replaced with another regular oil, instead of an essential oil. Lemongrass EO would be very lovely added at trace though! It’s one of my favorite soap scents! Maybe try 1 or 2 tablespoons of it stirred in right before you pour it into the mold. Hi Julie! Tea tree is very different than tamanu oil, so it won’t work the same in soap. (Unless your tea tree oil is very very diluted in another carrier oil? Or is it a straight essential oil?) Instead of tamanu oil, you could use more jojoba, sunflower or shea OR bring in a new oil like sweet almond or something else that you like. Do you know how to run it through a lye calculator, to see if you need to adjust the amount of lye? If not, just let me know and I’ll help you figure it out! It’s such a small amount of oil that it shouldn’t change things a huge amount. If you still want to include tea tree oil, you can add it at trace, but a much smaller amount. Maybe half a tablespoon or so and then adjust from there, if you’d like. Thanks for the super quick response and great advice! I’m learning so much. I just love your site! I’m thinking I’ll add the 1-2 tbsp of lemongrass EO you mentioned for scent, and I’ll use shea as the substitute for tamanu oil. Not so sure how to use the lye calculator yet. Can you steep the dandelions in warm goats milk and use that as your liquid? Would that mess up the combination? Hi! I just tried this recipe and I’m fairly new to soap making. My bars have a dark center. How do I fix that for my next batch? Hi again Jan! I made your lovely soap and subbed sweet almond for the tamanu since I didn’t have any here. This has to be another great from you! I love this recipe and did mine HP with a little lemongrass EO added for scent and it came out just lovely and bright! I didn’t have any natural colorants here either, so just left it plain, but next batch I’ll make sure to order some annatto for pretty color! Love you girl! in step 8: Before mixing, make sure your lye and oils are roughly the same temperature in the range of 90 – 115 degrees F. It’s okay if they’re 10 or even 20 degrees different than each other though. I’ve been having such fun gathering dandelions & getting tea made & frozen. Lots of oil infused as well. My 15 year-old son just accused me of being in a “mid-life crisis” with my new soap projects. He won’t be laughing when he learns to love my soaps! :) Do you usually add any scent to this soap? The recipe did not mention any, so I didn’t. My soap gelled beautifully overnight, but I’m concerned that I’m not thrilled with the scent. Maybe that will change some as it cures? Just curious. Excited to try this once it is ready! How much annatto seed powder did you use in this recipe. I saw the comment in your eBook that you used it for coloring, but I didn’t see that comment here. Hi Joy, Thanks for pointing that out, I missed adding that information! I’ll be sure to go in and fix it. The orange soap that is the third one up in the stack is colored with 3 teaspoons annatto seed powder, while the yellow right above it was colored with only 1/2 tsp annatto seed powder. So, you can use annatto seed to get pretty much any yellow to orange color you’re looking for. Thanks so much. I’m learning so many new things about soapmaking! 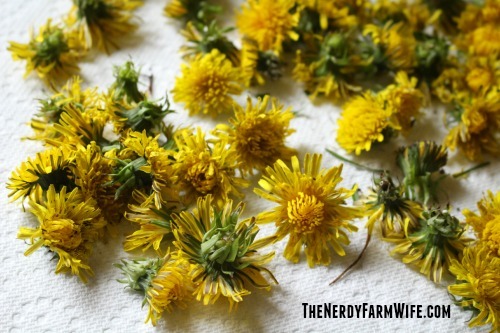 When you pick and dry your own dandelions, do you use the flower petals and leaves? I thought about ordering some, but it just says ‘leaves.’ Is that just the way they word it? Hi Joy! I use the petals, but just a few stems and leaves. I haven’t found a place that sells just dandelion flowers. The root or leaves are sold though. I think it’s because the flowers often turn to seed when dry and they have a shorter shelf life. Within a few months, they usually lose color and fade which is a pretty good sign the vitality and beneficial properties have left a plant. So, it’s probably not a profitable flower to carry. When you make the dandelion tea, are you using tap water or distilled water? Hi Lilly! I use tap water, since we’re on a well and it’s always does fine for me in soap. If you have treated water though, you’d probably want to use distilled. Does anyone know if this can be made using a soap base instead of from scratch? Hi Karen! I’m just not sure, since I haven’t worked with soap bases. If you can add extra oils to them though, then I think you could add a bit of dandelion infused oil perhaps? 1) do your soaps have a expiration date? 2) does light or extra virgin olive oil make a difference? The shelf life of soap is dependent on several factors. The most important is to start with fresh oils. If your oils are old, then your soap will develop DOS (dreaded orange spots – indicating rancidity) much faster. You also want to store the unused bars out of direct heat, sunlight or fluctuating/humid areas, like a bathroom. Freshly cured soap is usually good to use for at least a year, though I’ve pulled out bars that were 5 years old and still in great shape. If it starts to smell like old oil or rancid, then you’ll know your soap is past its prime and should be tossed. You can use either light or extra virgin olive oil. The only real difference is that the light olive oil makes a lighter, whiter soap, while the dark green of extra virgin olive oil can often tint your final bar of soap a shade of green or greenish brown.